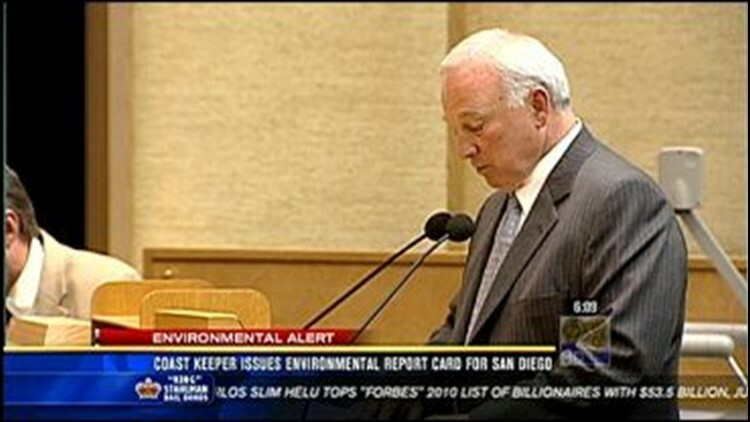 SAN DIEGO (CBS 8) - An environmental report card is out for the City of San Diego. San Diego Coastkeeper says it reviewed city council minutes between October 2008 and December 2009. It says most council members got a C or F grade because San Diego's water sources are drying up, and some council members voted against a water recycling program. The group also analyzed the budget decisions of Mayor Jerry Sanders and gave him a C.
Coastkeeper also claims Sanders has not made the environment a priority. "San Diego is one of the cities of its size without a point person in the mayor's office to manage environmental initiatives. Mayor Sanders also decimated budgets related to environmental programs and refuse to consider new revenues," Colin Parent League of Conservation Voters. The mayor says he has several people dedicated to environmental issues. Since taking office, he also helped add enough solar power to the city to power 1400 homes.